A leading landscape designer is helping a charity transform a garden for patients at a city hospital. James Alexander-Sinclair will be working with Friends of the Neuro Ward to renovate a therapy garden on the grounds of Woodend Hospital. Caroline, her husband Kevin and dog Crumble, in their own garden in Orkney. The TV presenter met up with the founder of the charity yesterday to view the site he will be adapting for patients. Caroline Critchlow set up Friends of the Neuro Ward to help support patients undergoing treatment for brain tumours at Ward 205 at Aberdeen Royal Infirmary. 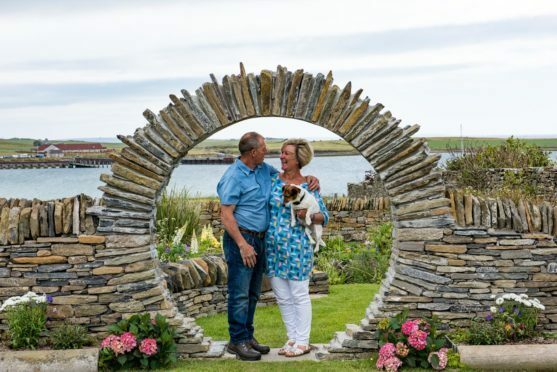 She previously created her own therapy garden in Orkney, in a bid to raise funds for the unit, after her own husband, Kevin, was treated in the ward. Now she has turned her sights on helping patients at the Neuro Rehabilitation Unit at Woodend Hospital. The unit treats patients from Aberdeen, Aberdeenshire, Moray, Orkney and Shetland. 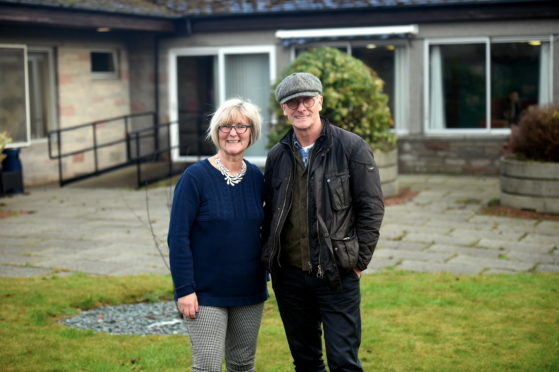 Mrs Critchlow said: “When I found a derelict garden at Woodend adjoining the neuro rehabilitation ward, I decided it was in desperate need of a total makeover. Many patients treated at Aberdeen Royal Infirmary after suffering a brain tumour are transferred to Woodend Hospital for rehabilitation. 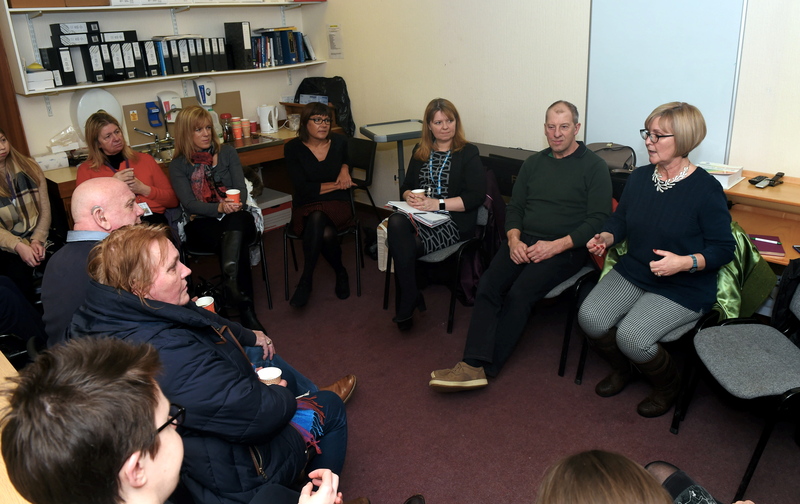 Mrs Critchlow added: “We try and make a difference to the lives of people on Ward 205, a ward which doesn’t receive charity funding from anywhere else. “We’ve done some cracking refurbishment work there, but also wanted to make sure the patients moved to Woodend were not forgotten about. 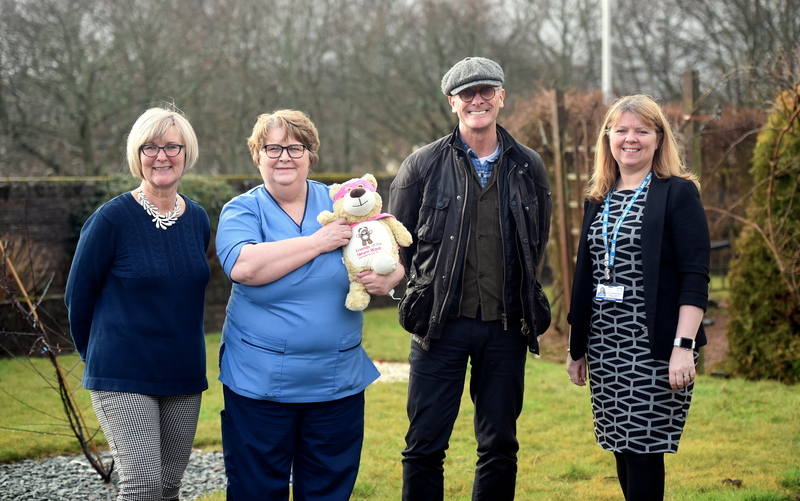 Pictured from left, Caroline Kritchlow from Friends of Neuro ARI, Arlene Ingram, Senior Charge Nurse, James Alexander Sinclair and Gillian McDonald, Deputy Service Manager at Woodend Hospital. Mr Alexander-Sinclair explored the garden yesterday and decided the site had great “potential” for Ms Critchlow’s vision. He said: “To be able to take two steps from the medicine stifled environment of the hospital, and into an open, beautiful garden, is extremely important, and something I aim to achieve. “It can and should be done. “I want this to benefit not only the patients, who deserve it so much, but also their families, nurses, visitors and even cleaners at the hospital. Friends of the Neuro Ward will work alongside Mr Sinclair, and a steer group from the hospital to make the renovated therapy garden a reality. However the charity will need extensive funding to help make sure it can be maintained.